Fishing Lures for catching salmon in the Pacific Northwest. When fishing for salmon in the Pacific Northwest there are endless tackle options for targeting the regions favorite species. One trip to the tackle shop staring into endless Isles of hooks, bobbers and the like can be a mind-boggling experience. Never fear this article will help shed some light on the topic and provide you with the Top 10 Best Salmon Fishing Lures that actually work when fishing for salmon in the region. First, let’s make sure we have a clear understanding of what a Fishing Lure actually is. The simplest explanation is that a fishing lure is a type of artificial fishing bait that is designed to attract the attention of a fish and hopefully persuades them to bit your offering. I know, easier said than done right? Endless anglers have spent long arduous hours pitching gear into the water with the only action being a tree branch or a log. So before you run the river and jump in the boat, I have to stress the single most important factor that will determine the success of any angler that hits the water. It’s actually quite simple, you see the fish have to be there. No fish means no love. If you’re casting into an empty hole, you’ll have to resort to the age-old story about the big one that got away. Wink! Wink! Not all would be a total loss though, you still get some casting practice. Learn the waterways you plan to fish, find out where the fish are most likely to hold up, then and only then will you have a fighting chance, no pun intended. One of the best ways to do this is to hire a fishing guide or even better if you know someone that fishes the area have them show you the ropes. 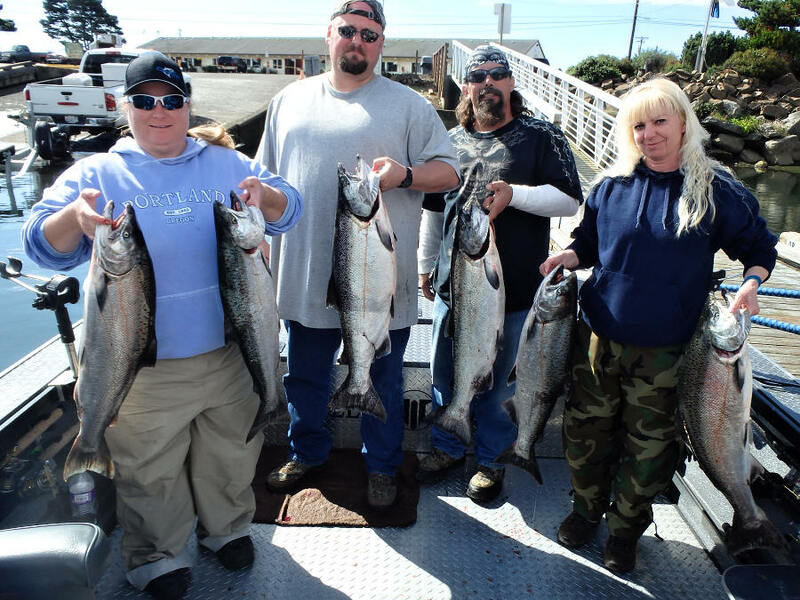 Photo courtesy of St. Laurent Guide Service Book your Columbia River Fishing Trip today! Another item I would like to address is a term every angler should come to know and love. It’s called “Bait”. Time and time again, anglers using bait will out fish the guys using conventional fishing lures. Some will say that their favorite lure is the only way to go, but very seldom have I seen gear guys catch more fish than the bait guys. In the Pacific Northwest when fishing for salmon in the salt herring is king, but candlefish, anchovy’s, and sardines can be the ticket as well. When river fishing, you’ll want to use sand shrimp and salmon eggs for the best results. With that being said, there are still hundreds of anglers out there catching salmon of artificial fishing lures, we, however, felt it was important to mention that bait fishing overall produces the highest catch rates. So now that we have covered the bait debate, let’s get into the nitty-gritty. When fishing for salmon in the Pacific Northwest there are several lures that have stood the test of time and provided many and happy anglers proudly hefting up their prized catch. 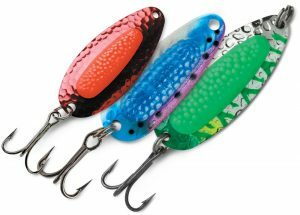 The information below are our Top 10 Best Salmon Fishing Lures that consistently produce results and in our opinion are the best of the best when it comes to using artificial lures to catch salmon. The closest you’ll ever get to the results of real bait is Brads Super Bait. They have superior spin over cut-plug and because they don’t break down like natural bait you’ll spend more time fishing versus bait swapping. Brads artificial cut plug also has a cavity inside with a sponge for adding different bait scents like herring oil, Anchovy scent or shrimp. Even better you can take the sponge out and can put a herring fillet inside for even better results. Colors vary but I personally have had the most success fishing the brads with the natural colors versus some of the more flashy ones available. 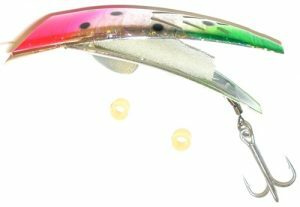 This lure has been one of the most successful at catching salmon in the Pacific Northwest making out our number one pick for salmon fishing lures. When fishing the salt the Buzzbomb is an excellent choice. 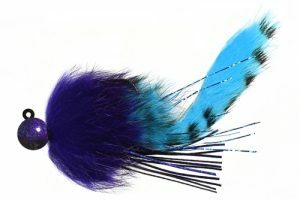 They come in a variety of colors and have proven effective as catching salmon over and over again. 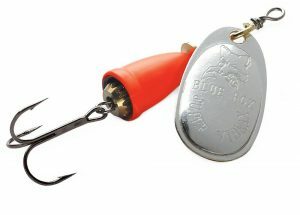 One of the great things about a Buzzbomb especially if you a bank fisherman, is that you can cast these things a mile. This allows you to get your offering in some of the deeper waters where the fish tend to hang out when casting from shore. Most effective colors are White with the green or blue stripe or solid pink or orange. 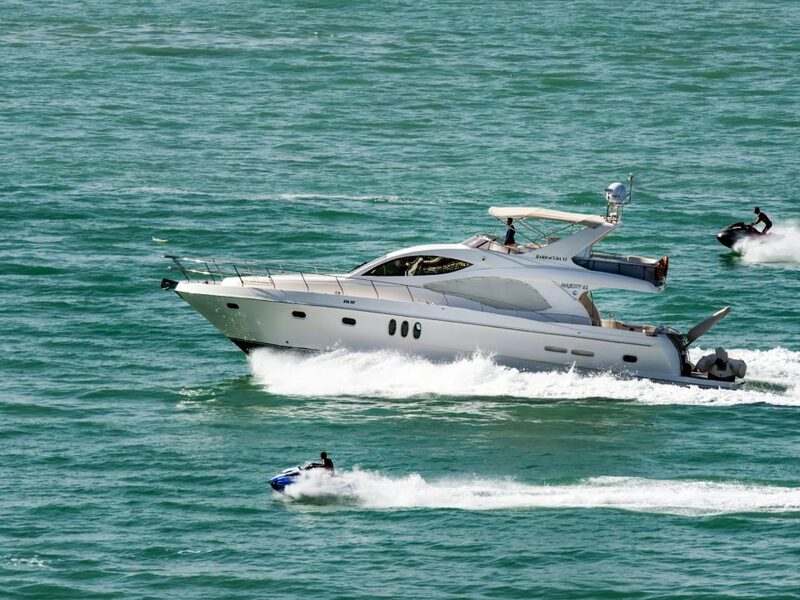 For a little added attraction you can place a Hoochie on the end to give it a more natural appearance in the water. Also, many anglers like to add a little scent to attract the bite, the most popular is Herring, then Anchovy or Shrimp. I’ve even seen guys killing it by squirting a little WD40 on their Buzzbomb as an attractant. I’m not sure if it’s legal but it does works. Some anglers will tell you plain yarn in the only way to go. Other prefer a colorful cork above a hook. The combo together is a match made in heaven. The Corky and yarn are among the most effective freshwater fishing lures in the region for catching salmon and steelhead. This fishing method requires that an angler cast upstream and let the lure bounce off the bottom of the river while being carried downstream by the current. I prefer to use ½ to 1 oz. weight to hold the setup on the bottom of the river and run anywhere from a 3 ft. to 6ft leader depending on the river and depth of the waters I’m fishing. 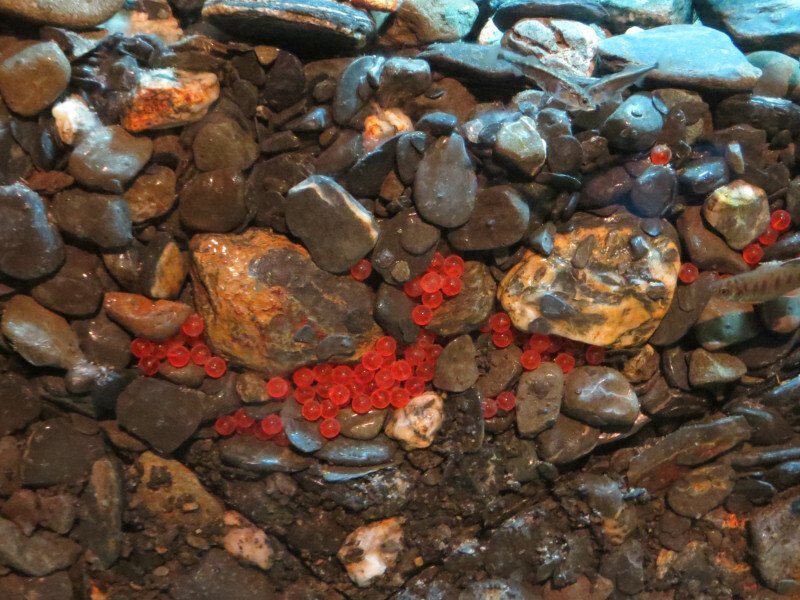 If allowed I also use salmon egg scent as an attractant. Fishing Beads have been a salmon and Steelhead fishing favorite for years because they are extremely effective for catching salmon, trout, and steelhead. Although fishing straight beads in the right condition will work for optimal results I apply scent. There are ton’s to choose from but you can never go wrong sticking to a species natural food source so I use salmon egg scent. I also a little yarn to help keep the scent on my lure thus creating a super effective fishing lure. There are many great fishing beads companies out there today but I like to use Stone Cold Beads for the added weight. 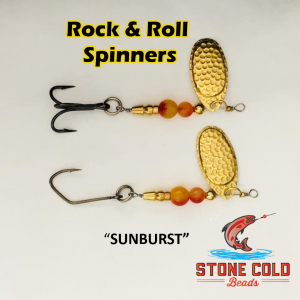 Their beads are the only one I know of in the industry made of natural gemstone and in my opinion, they are the best fishing beads in the industry. Plus they’re eco-friendly. The Spin glow is the perfect lure for the plunker in us all. Although spin glows are used for bait fishing. They have proven over and over again as an effective attractant. If you’re looking for a more relaxed form of fishing, it’s hard to beat a Spinglow with a chunk of sand shrimp when plunking northwest rivers for salmon. 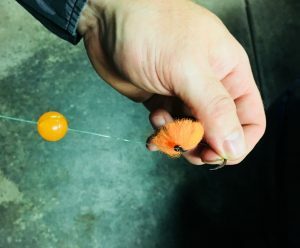 Pink and white or orange and white are the most popular colors, you’ll need to use a lot of weight though with this application as it is required to hold the bait down on the bottom of the river to keep from getting sweated away by the current. Spinners have been one of the most popular fishing lures for years. 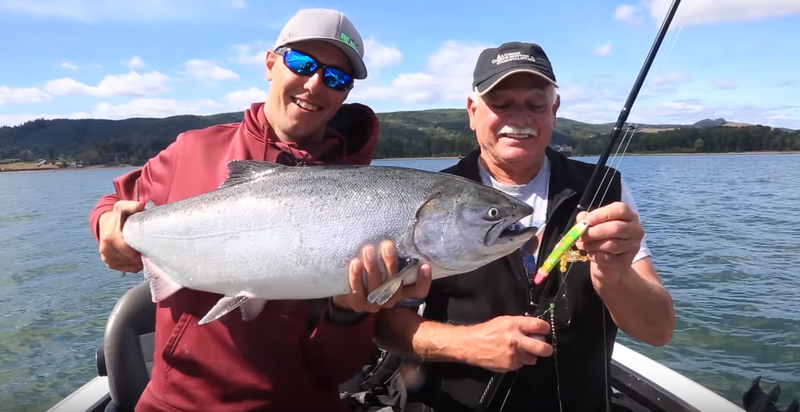 Although there are several tackle companies like, Mepps, Luhr-Jensen, Panther Martin and a whole bunch more that produce similar results, the Vibrax spinner is among the most common and the size 5 is hard to beat when fishing for salmon. The chartreuse is probably the best color for Coho, but the blue, purple, pink and orange are all winners as well. I prefer the larger one at about 13 grams because you can cast them farther without adding weight. Some guys like to add a Hoochie skirt at the bottom as well to add to the attraction. Scent varies, baitfish scent for the salt and egg or shrimp to freshwater fishing. 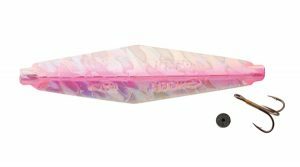 When it comes to fishing for salmon in fresh water, the Hawken’s Fishing Aerojig it hard to beat. The Aerojig has proven a Coho killer over and over again as well as a steelhead favorite. I don’t recommend using these jigs in the salt, but when freshwater fishing for salmon I like the ½ oz. to 1 oz. Aerojig twitching jigs. As far as colors I like the purple and pink for Coho and usually go with the Chartreuse and white for Chum. If you’re looking to target steelhead, most anglers float Areojigs under a bobber. I usually go with the 3/8 oz. in nightmare, pinks, and white or orange and white. These are the colors and seem to work best for Northwest steelhead. If applying scent I would go with salmon eggs or shrimp for flavoring. The Point Wilson Dart is near and dear to my heart. When I was 11 years old I caught my first salmon on a Point Wilson Dart Candlefish. Most guys troll these from a boat but I was able to catch a 32lb King Salmon off the beach at Fort Warden. I use the green ones with the shiny coating because they most closely resemble a live candlefish. 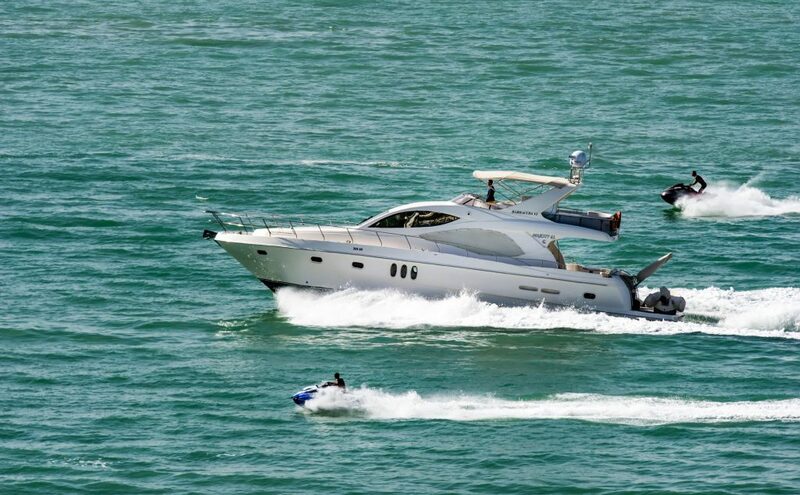 I also like to put a little bend in mine to give it a little more action in the water. The Hoochie has been a long time favorite for trolling the saltwater for salmon in the Pacific Northwest. 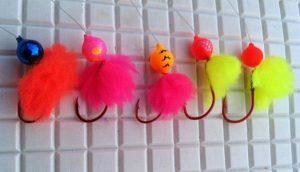 Bright colors work best when Hoochie Lure fishing a Hoochie because generally, you’re getting the lure down deep in low visibility waters. Anglers run a downrigger to get the lure down to the depth necessary to get it in front of the fish. Last but not least on our list of top salmon lures in the Pixee spoon. There are several spoons on the market but I personally have had the most success with the Blue Fox Pixee. They have an interchangeable color insert that allows for swapping out different colors based on the fishing conditions. I tend to prefer more natural colors in high visibility waters and the more bright colors in low visibility situations. Although not as effective as the lures we have covered above. The Pixee has been tired and trued and still remains a contender with fishing for salmon in the Pacific Northwest. So there you have it. These are the Top 10 Best Salmon Fishing Lures in the region. If you’re looking to target these magnificent fish then I highly recommend you try one or try them. Be sure to get a variety of colors, every area is different and different colors produce different results. Try swapping out if the color you’re using is proving ineffective. Also, if your fishing in an area where you have company, see what the other fisherman are using and what is working for them. Overall most anglers are happy to share tips on what works and what doesn’t, you just have to take the time to ask. In conclusion, we are aware that many anglers may not agree with our top ten, there several other lures that will work for catching salmon as well. A few notables that where contenders are Kwik fish, Brad’s killer fish, and Mag Lips which are all very effective as well. The Lunker’s Guide is a participant in the Amazon Services LLC Associates Program, an affiliate advertising program designed to provide a means for sites to earn advertising fees by advertising and linking to amazon.com.